I am glad Franciso had the courage to tell what he knew but I sure hope he goes into a witness protection program. These boyzzz are trouble!! Certainly Punks, but trouble nevertheless. All these guys are nothing but trouble. The witness probably gave LE a lot more information than you could get your hands on. The big problem now is to get all the information checked and verified. This may clear up several cases other than the one concerning Chris. LE needs to go after every one of Hataways associates and check them out for five or six years back. I have to say I have spoken with or interviewed a few of them, they are decent guys (obvious nobody we have spoken of as of late) they grew out of the “trouble”, he did not, apprently. Way to drill into the dark heart of this case, Blink. Hataway sincerely believes he is going to beat this rap Word Girl, and to be honest I highly doubt this statement from Francisco comes in. This is not the strongest case I have ever seen, unfortunately. I think Hataway is a danger and should not get out of prison , and that can happen when someone is what I will call “overcharged”. We need the female this allegedly happened to (Arrellano statement) to come forward, Orange County has to have a chat with Hataway’s attorney’s that might make him want to talk in either Ocasio or George cases, imo. 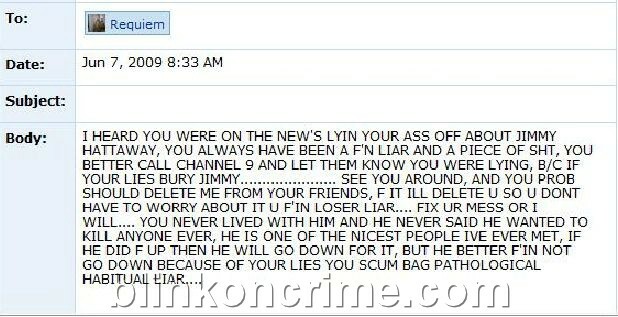 The writer of the myspace message to Francisco appears to be a female. No. I do know who he is, but there was no reason at this point to release his ID, I found many people that had no idea what Jimmy was up to. Thank you so much for your hard work, patience and for helping these families find their missing loved ones. Your diligence and love have no boundaries. God Bless You! So, Blink, the tech footprint is there, and someone knows who sent the message? Blink, please take care of yourself as you move forward into each case. Personally, I can’t imagine, other the turkey who sent this threat (who must be threatened by him in their own right mind), wouldn’t really want to fight Hattaway’s battles while he’s incarcerated. In fact, I’m willng to bet that some of his ‘associates’ are relieved he’s in jail. The fear this demon instilled on anyone who came into contact with him, no doubt, had them doing things for him they’d never consider unless they felt they’re own lives were in danger. I pray for the sake of those who do come forward that Hattaway is locked with key destroyed. Sick is an understatement. This is a serial killer in the making, if he isn’t already. I pray for the families that justice is the means to the end of this heartless killing machine. Re #7 Sorry Blink, it was late and I read your statement wrong. I thought it said in #5 I dont know who it is….my apol. Praying for you daily. Then you appreciated my fairness in showing both sides, correct? You have a tremendous vocabulary and deep wit, can I have that and not the other next time? Latest on Hataway… infatuated with breaking necks. If Hataway is found not guilty at this trial, is he going to walk out of the courthouse a free man? Are there other charges pending for him? Shouldn’t they hurry up and free him before spring break arrives at Daytona Beach? I believe Central Florida is already designated as the most dangerous place for a young lady to visit during spring break. Why not have a serial killer out there with the others? Seriously now, if he gets released can facebook or twitter send out a message with his pic to warn spring breakers or any young women to look out for this creep? Do you have connections? To my knowledge, the only pending charge against him outside of these is a paraphernalia charge in Orange County which is a misdemeanor. I think you know I have great connections, but if he is acquitted, I can promise you “alerts” to crimes he has been acquitted of is grounds for a harassment charge nobody is going to take on voluntarily. Keep your fingers crossed as I am. Thanks Blink. My fingers are crossed. I have a ton more to say about this but will withhold my remarks until his trial is over or nearly over. Have they drained the lake or a couple of lakes near where Tracy’s boat was recovered? If not, why not? Gosh, Boz, I thought I’d missed something, like a Boat! Lol. I have a feeling that the jury will convict–on a lesser charge–if that is possible. It depends on how credible are those witnesses to that sidewalk beating, I think. My bosses have always taken the side of the complainant, except in one significant matter, but maybe juries can see both sides of the case? Many people have asked me if Jimmy ever choked me or showed signs of abuse while we were dating. My answer is still NO. The only time he ever was aggressive was when he was drunk (really drunk). Sometimes when leaving a bar he would half hug me from the side with his arm over my shoulders and bring his forearm in to pull me closer to him. Under normal circumstances this is a natural behavior but sometimes when Jimmy was trashed he’d pull too hard on the outside of my neck with his elbow area (not his hand) and I’d tell him to stop because it hurt. He always let go. Never did he threaten me, hit me, choke me etc. I have clearly stated in previous posts that I dated him a couple of years before Tracy went missing. Increasing drug use could have changed his behaviors. 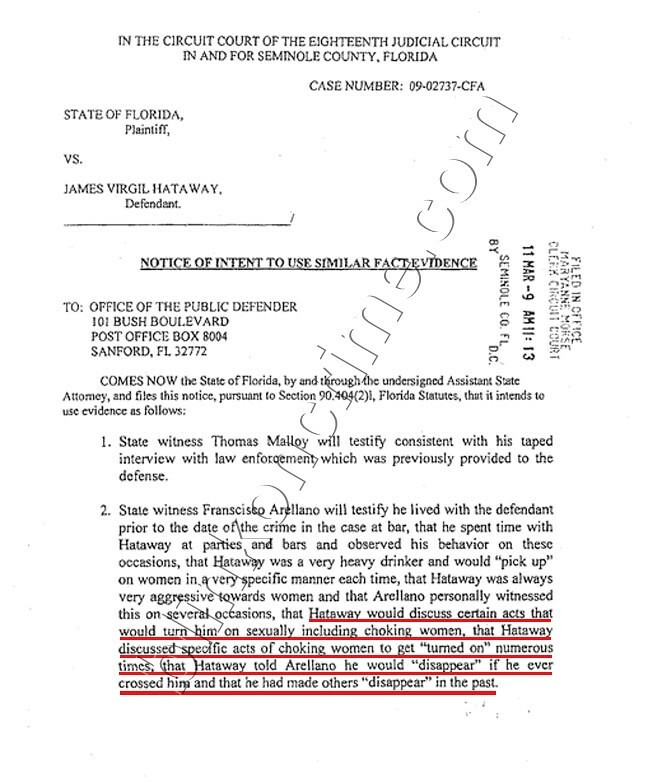 Boz- I believe that if Jimmy is not convicted of the current charges that he will leave Central Florida. He’s left the area before about a year after we broke up and moved to either N. Florida or S. Georgia (can’t remember). He was living with a girlfriend at the time. I think that the publicity of this trial will be far too much for him to live down here (guilty or not). So maybe we can hold off on the “beware” flyers until we see what happens. Daytona can rest comfortably tonight. Blink, any word on DNA confirmation? It seems like we have been waiting forever. Thanks. Possibility of it coming this week. WHAT?? No evidence of foul play?? WTH??? That is a reporter assumption, there has been no official word from LE or the ME. We are in “wait” mode. It sounded odd that a reporter would even make that leap after all that has happened leading up to finding Chris’s body. Ex gf said: Sometimes when leaving a bar he would half hug me from the side with his arm over my shoulders and bring his forearm in to pull me closer to him. Under normal circumstances this is a natural behavior but sometimes when Jimmy was trashed he’d pull too hard on the outside of my neck with his elbow area (not his hand) and I’d tell him to stop because it hurt. He always let go. That scares me. It’s not normal. He was an average sized guy. Can you imagine if a very large man squeezed you like that? What would have happened if you did not say STOP? MEN do not HURT women on purpose, drunk or not. Sorry, sounds like he was practicing. Good thing you got out of that relationship. I know, innocent until proven guilty. Did you hear the 911 call from the girl who helped his victim in the case that’s in court right now? It is in conjunction with the current attempted murder charge, although I do not know what he is accused of burglarizing. Hearing of the burglary charge surprised me too. How can we get current updates on the trial? I’ve checked all the local news websites, nothing yet. Blink, is there any way you can post or direct us to the opening statements? Jimmy took Rachael Clarke’s car keys out of the ignition = burglary. Thanks for clearing that up for us Rachael. You are so much on my mind as you know. Local channels 2 and 9 are typically consistent in giving good coverage, as is the Orlando Sentinel. Thanks. There’s so much going on this morning in Central Florida, sadly the Hataway trial is going to be on the back burner of the news. Chris’ mom, I want to say something to cheer you up and encourage your dedication to your quest for answers and justice but don’t know exactly what to say. BE STRONG is the best I can do. Boz, I hear what you’re saying, it could have been “practice” but I never felt he was trying to hurt me. It was always sorta playful. My current boyfriend occassionally does a similar gesture although admittedly not as hard. Jimmy is around 5’8″ and I’m only 5’4″ so although he’s an ‘average sized” guy he’s still bigger than me. I brought up the story because it could shed light on what happened to Rachel in the car. Maybe he “hugged her” like that and she got scared. I fully admit I CANNOT explain the rest. I did not hear the actual 911 tape. But I have read the reported excerpts. Chris’ Mom- Thank you so much for the clarification on the burglary. I saw that charge and it never made sense to me because the witness said he ran away, not back to the car. I never heard that he took her keys but you’re right, that’s burglary! Boz, BE STRONG is perfect because ultimately it’s the heart behind the comment that matters and that is shining through…I appreciate your encouragement. I’ve been asked by the press why I am there and I don’t recall what I told them but after giving it some thought I’ve determined that my purpose in being there is to support, observe, and pray. I can’t help but think that this has the potential of being so much harder for the Ocasio’s than for me because this is a blow by blow account of what Jimmy did to Rachael (yes, she spells it the same as I do). Only God can give a person the grace to not go crazy over that. As always seems to be the case though the Ocasio’s help me so much more than I feel that I can help them. For example, they are picking me up and taking me to court this morning because my truck died on the way home yesterday and I had to have it towed. I’m praying that he will be convicted and live the rest of his life behind bars…for the benefit of future victims that will undoubtedly fall into his snare if he is allowed to return to society. ex gf: If I were you, I’d say a prayer every night you’re breathing and are EX gf. Just my opinion. Chris’ mom: I’m very sorry to hear about your car troubles. I wish I could assist you(I live in Orlando) but my personal life does not allow me the time. BE STRONG! Thank you! to the Ocasio’s. I’m very impressed with Rachael Clarke. What she’s doing cannot be easy. I wish I knew she read here so I could tell her ‘thank you’ beyond belief. She WILL save another young lady from this monster’s grip. James Hataway was convicted as charged on all 4 counts today. Two of those charges carry the possibility of a life sentence. Sentencing is scheduled for May 9th. Well now, that is kismet. It is the start of the Casey Anthony trial as well. As we discussed earlier, I am with you, and this is now an open door for us. I was wrong regarding the burglary of a conveyance. The taking of the keys was the robbery charge. The attorneys explained the burglary more clearly today but I don’t have my notes with me and I’m not going to attempt to explain it. Regardless he was found guilty of it and it is my understanding that it carries the possibility of a life sentence. My thoughts and spirit are with you, Chris’s girl, Chris, Tracy, and The Ocasio’s tonight. Lastly, my thoughts and prayers are for Hataway’s little girl, completely innocent, and probably will not see her Daddy. Happy Easter everyone!! I hope you all have had a great weekend celebrating with those you love. I love you Chris and miss you.